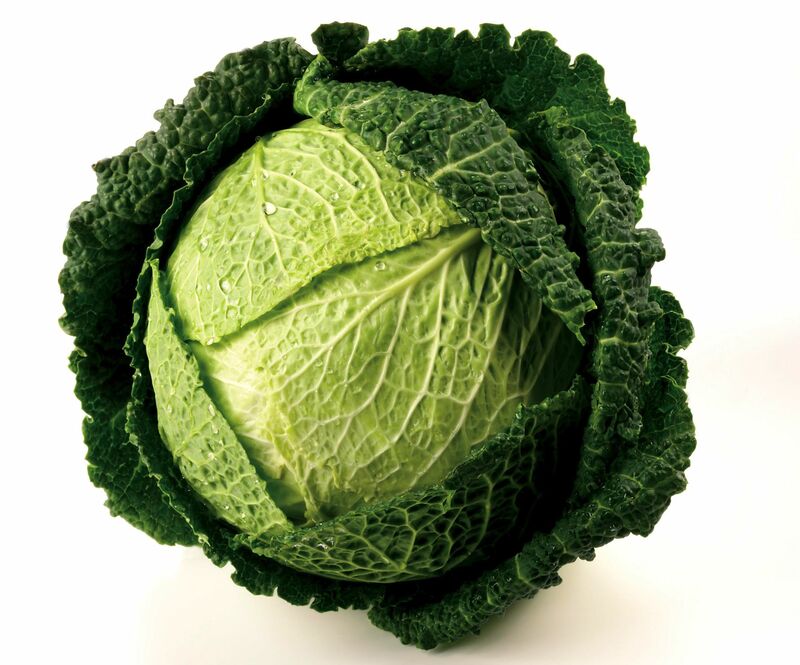 Central and Eastern European meals centered around sauerkraut, cabbage, potatoes, dried fruit, and bits of pork, usually sausages or bits and pieces, and the families who immigrated to Lancaster and surrounding counties in PA in the 1730’s brought those foods with them where they remain popular today. “The Jewish people have their kosher chicken; the Bohemians roast pork, sauerkraut, and dumplings; Syrians their sweets—and Americans a thick beefsteak with occasional side dishes from all the others”. – Harper’s Weekly. Dec. 1918. In June 1906, a woman living in the Bavarian village of Spitzendorf was reported as having lived to the age of 118 on a diet of, “sauerkraut, dumplings, potatoes, and buttermilk”. Whether her longevity was the product of diet, lifestyle, or genetics is anybody’s guess, but the diet certainly doesn’t seem to have had any adverse reaction. – The Pharmaceutical Era. Another recollection of those…days is that of a big dining-room, heated by an iron stove, where, over backs of chairs and on the long extension table were spread sheets of yellow nudel dough. How often were my sister and I set to work rolling the sheets into long thin tubes, and then cutting them as fine as possible into the finished nudeln. Supper on such a day had usually for its ‘piece de resistance’ a huge dish of boiled ‘noodles’ dressed with brown butter and breadcrumbs, also browned to a turn with the butter. This dish rejoiced in the name of ‘Schmelzte nfidel’, if that be the way it was spelled. ” – The Christian Advocate. April 11, 1907. The writer of that article described the making of filled dumplings which she thought fit for the immortals. “Into a big frying pan are put plenty of butter and a finely minced onion. Before either can brown, mashed potatoes and bread cut fine are added, with parsley, pepper and salt, and sometimes sweet marjoram, an herb that takes the place of the New Englander’s sage in their cookery. Stir this mixture constantly till heated through and through. Then break over it eggs enough to make a slightly moist paste, and heat over a slow fire. While this is heating, the cook makes a dough only a little less stiff than that for noodles. Roll out some of this dough into the shape of a small saucer. Place on it some filling and fold it together into a half moon, pinching the edges tight shut as for pie. Lay on a floured platter until the ‘knep’ are ready. Meanwhile a large kettle has been filled with water, well salted, and allowed to come to a boil. Into this the ‘knep’ are plunged, not too many to crowd the space, the cover is put on tight and they are allowed to boil for fifteen minutes, approximately. Like Southern fried potatoes and cornbread, many dishes like sauerkraut, were relished at home, but were felt too coarse for visitors. “…it was somewhat out of season for sauerkraut but our southern friends seemed to think that as they were among the ‘Pennsylvania Dutch,’ that favorite dish would be found the whole of the year. They did not know that like their ‘hog and hominy’, sauerkraut was especially a home dish, and never set before strangers”. – Hoke, Jacob. The Great Invasion of 1863. 1887. Dayton, OH. Hopefully my foray into Pennsylvania Dutch cuisine has shown that the Pennsylvania Dutch people are much more than the Amish of the Lancaster, PA area, and that the cuisine is much more than Shoofly pie. Watch for the upcoming post as I prepare the ubiquitous pork with sauerkraut and dumplings and serve up some Blissful Meals from my own Alabama kitchen. cream or milk which would produce the custard-based tart I want. in quantity enough to sweeten it. nutmeg, this should produce the sort of tart I want. over the Fire, bake it in the Tart-Pan. – Evelyn, John (1620-1706). Silva: Or, a Discourse of Forest Trees. 1729 edition. London. deep dish; cover the whole with a crust and bake. – Dolby, Richard. tart like that of frangipane. I’ve mentioned before that I’ve researched the Mister’s family and I continue to dig even deeper into their lives, but knowing who they were has only left me wanting to know more about their daily lives. 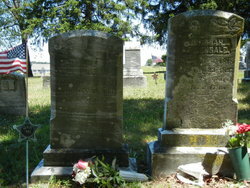 Long before I knew they were the progenitors of my beloved, I admired many of their churches, cemeteries, and quaint little towns with their odd-sounding names, places that have since taken on a profound significance for us through knowing his ancestors were instrumental in the settling of those places or in their worship in the newly-founded churches. A foodie, especially a historic foodie, can’t help but gravitate toward the foods they prepared and lovingly placed on the tables for their families, and so now my journey is taking me down the paths of those culinary traditions and gardening practices of the people whose names now look up at me from ancient tombstone photos. I put a great deal of work into the genealogy but unraveling the threads of culture and tradition won’t be nearly as time consuming thanks to William Woys Weaver and his two excellent books – “As American as Shoofly Pie” and “Pennsylvania Dutch Country Cooking”. “Shoofly Pie”, like the books I write, is primarily a history of Pennsylvania Dutch cuisine and culture with authentic recipes in the back. I found it especially nice that he has traveled extensively through the countryside interviewing average people about the foods they make, those their parents, and even grandparents made and providing variations of the dishes reflective of the countless ways each family prepared the same soup or dumplings. Equally as important as the recipes are the ways they were served and shared. In doing my own research I was finding authentic recipes, and I was finding some discussion of cultural intricacies, but unraveling the traditions associated with the foods themselves was coming up flat. Mr. Weaver’s sharing of his personal interviews with hundreds of families whose ancestors traveled across the same ocean and then took the same paths during the same decade as Martin’s has added a depth of understanding I would never have gained on my own. “Pennsylvania Dutch Cooking” is a real honest to goodness cookbook with all the glossy photographs and entertaining dialogue one would expect from such a book. I’ve enjoyed the photographs, taking a mental note of how many of the antique cookware pieces I have in my own collection as I flip through it. Seeing photographs of the prepared dishes allows my mind to wander back to the 1730’s when the family was gathered around the table talking about everything from crops to holiday festivities or putting up a year’s supply of sauerkraut and dried fruit with these very dishes on the table before them. Just as I traveled extensively and ate my way through Scotland at every out of the way place I could find in order to compare my own preparation of the traditional dishes of my ancestors, with that of the country people whose families have prepared them for centuries, I find the photographs in Mr. Weaver’s book allow me to compare my own chicken and waffles to those prepared by farm women who have chicken gravy running through their veins. I, with a completely different heritage, can stand in my kitchen or at the hearth and make the same foods as those of Catherine Strausbaugh, Anna Bewerts Staub, Susanna Weisensale, Catherine Swartzbaugh, Appolonia Buck Schonebruck, and the other ladies I’ve gotten to know by tracing their paths from places like Alsace, Flanders, and Lorraine to Goshenhoppen, Conewago, Paradise, Pigeon Hills, Nockamixon, Brickerville, etc. I suppose it takes a foodie with a passion for history to understand how Pennsylvania Dutch food with names I can rarely pronounce can transport me back through time to their kitchens and family circle as I season, stir, knead, and baste. Top: Michael Araiza, and daughter, Annabelle. Michael is dressed in traditional Creek style, similar to that described in these accounts. 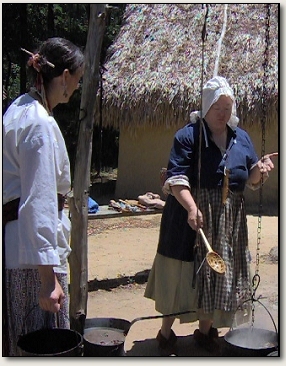 Bottom: Deb Jenkins, in traditional Creek attire, similar to that described for the Cherokee women in these 1760’s accounts, and I, in the village at Ft. Toulouse. In this article, I take a departure from my usual research into foodways of various cultures and time periods to discuss what the Cherokees were wearing during the mid-18th century. My great great grandfather was taken on the Trail of Tears at a tender age and made his way to North Alabama by the 1850’s. He fought in the Civil War and afterward drew a pension from Morgan County. On a recent motorcycle ride from Alabama to the California coast and back I visited the area where the Cherokee settled after the removal. I was disappointed in the museum exhibits and decided I needed a refresher on Cherokee dress from the period of 1760 through 1830. I have not changed the spelling from the way it was found in the original sources. In 1762, The Scots Magazine, Vol. 24, by James Boswell noted the presence of three Cherokee chiefs in London and the following comments were made as to dress. “They were dressed in their own country habit, with only a shirt, trowsers, and mantle round them, their heads adorned with shells, feathers, ear-rings and other trifling ornaments. None of them can speak to be understood, and very unfortunately their interpreter died on the passage. A house was taken for them in Suffolk street, and cloaths in the English fashion were given them. On the 8th of July they were introduced to the King. The head chief’s dress was a rich blue mantle covered with lace; his head richly ornamented, and on his breast a silver gorget, with his Majesty’s arms engraved. The other two chiefs were in scarlet, richly adorned with lace, and gorgets of plate on their breasts…The chiefs are men of middling stature, seem to have no hair upon their heads, and wear a kind of skullcap. Their faces and necks are so besmeared with a coarse sort of paint, of a brick-dust colour, that it is impossible to say of what complexion they are. Their necks are streaked with blue paint, something resembling blue veins in a fine skin.” July 1762. Next, we’ll look at what Bartram saw as he passed through their midst. “The youth of both sexes are fond of decorating themselves with external ornaments. The men shave their head, leaving only a narrow crest or comb, beginning at the crown of the head, where it is about two inches broad and about the same height, and stands frizzed upright; but this crest tending backwards, gradually widens, covering the hinder part of the head and back of the neck: the lank hair behind is ornamented with pendant silver quills, and then jointed or articulated silver plates; and usually the middle sascicle of hair being by far the longest, is wrapped in a large quill of silver, or the joint of a small reed, curiously sculptured and painted, the hair continuing through it terminates in a tail or tassel. The clothing of their body is very simple and frugal. Sometimes a ruffled shirt of fine linen, next to the skin, and a flap, which covers their lower parts; this garment somewhat resembles the ancient Roman breeches, or the kilt of the Highlanders; it usually consists of a piece of blue cloth, about eighteen inches wide; this they pass between their thighs, and both ends being taken up and drawn through a belt round their waist, the ends fall down, one before, and the other behind, not quite to the knee; this flap is usually plaited and indented at the ends, and ornamented with beads, tinsel lace, &c.
Beside this attire, they have a large mantle of the finest cloth they are able to purchase, always either of a scarlet or blue colour; this mantle is fancifully decorated with rich lace or fringe round the border, and often with little round silver or brass bells. Some have a short cloak, just large enough to cover the shoulders and breast; this is most ingeniously constructed, of feathers woven or placed in a natural imbricated manner, usually of the scarlet feathers of the flamingo, or others of the gayest colour. He went on to discuss the painting on the bodies and of tattooing although he does not use the word “tattoo”. The breast and muscular parts of the body, “were very curiously inscribed, or adorned, with hieroglyphick scrolls, flowers, figures of animals, stars, crescents, and the sun in the centre of the breast. This painting of the flesh, I understand, is performed in their youth, by pricking the skin with a needle, until the blood starts, and rubbing in a blueish tinct, which is as permanent as their life. The shirt hangs loose about the waist, like a frock, or split down before, resembling a gown, and is sometimes wrapped close, and the waist encircled by a curious belt or sash”. The dress of the Cherokee women was a, “flap or petticoat is made after a different manner, is larger and longer, reaching almost to the middle of the leg, and is put on differently; they have no shirt or shift, but a little short waistcoat, usually made of calico, printed linen, or fine cloth, decorated with lace, beads, &c. They never wear boots or stockings, but their buskins reach to the middle of the leg. They never cut their hair, but plait it in wreaths, which are turned up, and fastened on the crown, with a silver broach, forming a wreathed top-knot, decorated with an incredible quantity of silk ribbands, of various colours, which stream down on every side, almost to the ground.” – William Bartram, 1762. Travels Through North and South Carolina: Georgia, East and West Florida the Cherokee Country, the Extensive Territories of the Muscogulges or Creek Confederacy, and the Country of the Choctaws. John Walker’s description of Cherokee dress was similar to Bartrams, saying they had, “a bit of cloth about the middle, a shirt of the English make, on which the bestow innumerable broaches to adorn it, a sort of cloth boot and mockasoons, which are shoes of a make peculiar to the Indians, ornamented with porcupine quills, with a blanket or match-coat thrown over all complete their dress at home”. They were noted with only “necessaries” when on expeditions. “There is little difference between the dress of the men and women, excepting that [with the women] a short petticoat, and the hair, which is exceeding black and long, clubbed behind…”. – Walker, John. The Universal Gazetteer. In 1816, an Indian agent working with the Cherokee in Tennessee was in Washington with a group of Cherokee chiefs to settle a boundary dispute between the Cherokees and the Creeks, the lands acquired by Jackson’s, “so-called”, treaty. He sent an informative letter to the Niles Weekly Register, Vol. 10 from which I will quote some of the more interesting passages on Cherokee dress and craft. Some who had immigrated to Arkansas raised their own cotton and indigo and were good weavers of cotton and wool. There were among them some 500 looms of their own manufacture. The writer went on to discuss the discrimination against the Cherokee, most of whom were of, “decent handsome manners and deportment”. “The Cherokees universally believe in the being of God; they call him the Great Spirit; they mention him with reverence—with them, his attributes are power and goodness. They never profane the name of God in their own language. They have no size of words that they can combine to profane the name of God.” The letter was signed Return J. Meigs, dated May 4, 1816, and published July 6, 1816. In closing, while we have not discussed food at all in this piece, I will wish you my usual Blissful Meals anyway. Thank you for your interest and for allowing me to depart from our usual discourse. As I sat here munching on the salad I brought for lunch, picked fresh from my garden, I was really patting myself on the back for eating so healthy – until my eye wandered to the list of ingredients on the bag of croutons I’d sprinkled on it. My garden is small, out of necessity for my small yard, but it has kept me supplied in Parris Island Cos, beet greens, basil, arugula, and tomatoes for salads this summer. Other than Miracle Grow, it’s all grown quite well with no “stuff” sprayed, shaken, or sprinkled on it so why did I feel a need to add croutons with ingredients I can neither pronounce nor decipher? High fructose corn syrup; maltodextrin, calcium propionate, calcium peroxide, calcium sulfate, ascorbic acid, azodicarbonamide, sodium stearoyl, lactylate, artificial flavor, and TBHQ – doesn’t that sound just yummy? Not. The croutons in their bright green shiny bag are now in my trash can. With a picture of fresh parsley, Parmesan cheese, onion, garlic, and a loaf of white bread the image on the package is wholesome looking enough, but the list of ingredients which came out of the bag are pure garbage. Bread Sticks were created in Turin, Italy during the Middle Ages, sometime between the 14th and 17th centuries, depending on which story you prefer. There are legends associated with their creation which I have as yet been unable to provide primary documentation for, so they won’t be repeated except as a flight of fancy. Those stories center around the Duke of Savoy, Vittorio Amedeo II, for whom the bread was supposedly baked in the hope it would relieve his intestinal complaints. As the bread sticks are thin and crisp and more cracker-like in texture, it was hoped they would be easier to digest than the heavy bread usually served. In Italy they are called grissini, supposedly after the physician who “invented” them. They were, “bread not larger than pipe-stems…some two feet long, very brittle and easy of digestion…a specialty of Turin where they originated…” 1. Travel journals are fun to read when Americans or Brits encountered the grissini for the first time. They, “were not a little surprised on asking for bread to see the waiter bring in a number of long sticks, the size of pipe stems and lay them upon the table. We repeated the demand, and were near laughing when it appeared that both he and his master called them bread, and expected us to eat them. The taste was agreeable enough, but we found it took so much time to manage them, that instead of making away with a couple of yards (a moderate allowance for breakfast) we had hardly swallowed a foot and a half.” 2. 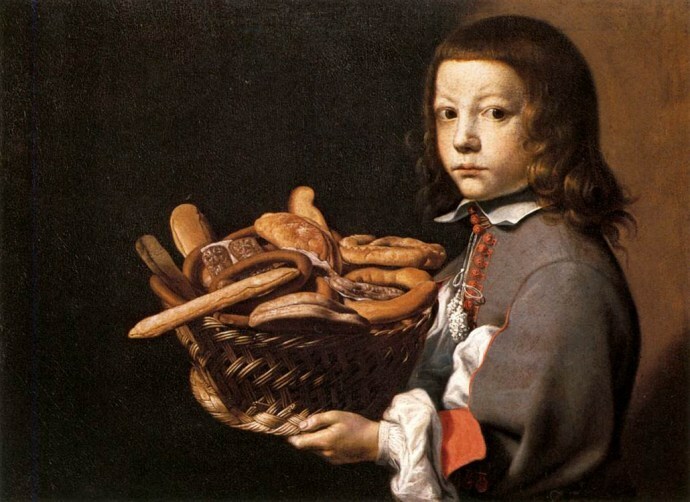 Rousseau recommended them for teething children  and said the “Piedmontese bread” was also known as Grisses. Turin is the capitol of Piedmont, Italy and that is why some 18th century writers used the name Piedmontese. 3. Several writers commented on the unusually long time they retained their crispness, and yet it was said, “grissini—Piedmontese bread, in long delicate stems, laid across the table, snapping as you touch them and melting like ice-cream on your tongue…”. 4. “We ate about three yards of bread which our musical waiter brought in a great bundle, like a parcel of sticks, under his arm! 5. The Dublin University Magazine [Oct. 1859] proclaimed grissini, the bundle of sticks, the, “most delicious kind of bread”. The grissini were often mentioned along with hot soup, minestra was a common variety, with cheese grated on top. 6. “By the side of each plate was a bundle of small sticks, of the size of slate pencils, and from eight to ten inches long. At first both the children were very much puzzled by them, but seeing the use their father put them to, concluded they must be a substitute for bread. So it proved. They were delicately browned, short and crisp, like crackers, and were a most convenient plaything between the different courses. It is said of King Carlo Felice, that he always took a basket of these grissini with him whenever he went to the theater, that he might have something to amuse him between the scene. Nowhere but in Turin are they made so nicely, so that the Emperor Napoleon, who would have them on his table in Paris, had them expressed to him every morning fresh from Turin”. 7. As for receipts, a London cookery book contained a receipt for Turin sticks in 1867, and by the 1880’s, receipts for bread sticks were being published on both sides of the Atlantic. They were sometimes called soup-sticks or salt-sticks. TURIN STICKS. Two pounds of white flour, two ounces of fresh butter. Rub the butter well into the flour; add two teaspoonfuls of baking powder, and sufficient pure cold spring water to mix it into a stiff paste; cut into little lumps of equal size, roll out into long thin sticks as quickly as possible; bake in a rather quick oven. 8. The following modern recipe for crunchy breadsticks comes from Taste of Home magazine. Combine the flour, baking powder, salt and shortening in a food processor, cover and process until the mixture resembles coarse crumbs. While processing, gradually add water until the dough forms a ball. Transfer to a floured surface. Roll dough into a 10 in. x 8 in. rectangle. Cut into 10-in. x ½ in. strips. Twist each strip four times and place on baking sheets. Brush with oil. Combine coarse salt and thyme; sprinkle over breadsticks. Bake at 350 for 18-20 minutes or until golden brown. Cool on a wire rack. Makes 16. 1. Taylor, George Boardman. Italy and the Italians. 1898. Philadelphia. 2. Dwight, Theodore. A Journal of a Tour in Italy in the Year 1821. 1824. NY. 3. Rousseau, Jean-Jacques. Emilius. Vol. 1. 1763. London. 4. Costello, Dudley. Piedmont and Italy From the Alps to the Tiber. Vol. 1. 1861. London. & The Ladies Repository. Vol. 24. May 1864. 5. Roby, John. Seven weeks in Belgium, Switzerland, Lombardy, Piedmont, and Savoy. Vol. 2. 1838. London. 6. Vine, Frederick T. Practical Bread-making. 7. Sewell, Alfred & Miller, Emily. The Little Corporal. May 1868. 8. Llanover, Lady Augusa Waddington Hall. Good Cookery Illustrated. 1867. London. Pulled chicken was chicken removed, or pulled, from the bone after being cooked. In his 1791 Antiquitates Culinariae, Or, Curious Tracts Relating to the Culinary Arts, Warner discussed receipts in The Forme of Cury penned by King Richard II’s cook. In his notes, he stated the spelling of, “yteysed” or “teysed” in old English referred to the custom of fowls, “pulled in pieces by the fingers, called “teezing” noting it was a custom still in vogue, and at the time of his writing  was called pulled turkey or chicken. Kettner’s Book of the Table quoted from the ancient practice, “Take brawn [flesh] of capons y-teased, or of pheasant teased small…Mawmene or mawmenny is a fowl minced…Mawfrey, or mafré, as the French write it, is a fowl frayed –what we still call pulled chicken”. Dallas, E. S. 1877. London. Charlotte Mason included it in her Bills of Fare in 1777 and receipts from the late 1700’s remained virtually unchanged into the early 1900’s. – Chesbrough, Mary Mott. The Daily News Cookbook. 1896. Chicago. & Enquire Within the One Hundredth Edition. 1903. London. John Farley’s receipt instructed the cook to boil the chicken, let it cool, discard the skin, and cut the white meat into slips. The meat was then put into a stewpan with a little cream, four spoonsful of veal stock, a very little grated lemon peel, and pounded mace, cayenne, salt, one eschalot, chopped, a little lemon juice and a spoonful of consommé. A little flour and water were added and put over the fire for 10 minutes to thicken. The legs and rump were salted and peppered, broiled until a nice brown, and served over the pulled chicken. – The London art of Cookery and Domestic Housekeeper’s Assistant. 1811. London. William Kitchiner’s receipt was much the same although he said adding egg yolks would be an improvement and he did not use consommé. He thickened the sauce with flour and butter and simmered it for 2 or 3 minutes, just until the meat was warm. – The Cook’s Oracle. 1822. London. Mary Jewry’s 1879 receipt is worthy of sharing, not because the dish is different from earlier versions, for it is remarkably similar, but because the instructions are more detailed for a modern cook. – Warne’s Model Cookery and House-Keeping Book. 1879. London. Writers told the cook that turkey, goose, pigeon, and other fowl could be pulled and some included a receipt for pulled rabbit. The rabbit was boiled with an onion, a little whole pepper, sweet-herbs, and a piece of lemon-peel then the meat pulled from the bones and combined with some of the broth, butter and flour, salt, pepper, nutmeg, parsley, and the liver. Merry-thought was the common term for wishbone in America and Britain and could still be found into the early 1900’s. The term wishbone is American. It was so-named from the old custom of two people holding one tip of the forked bone from the breast of a fowl and pulling until it snapped. The person whose piece was the largest was supposed to marry before the other. Dictionaries into the early 20th century defined wish-bone as merry-thought or forked bone from the breast of a fowl. The lucky bone was, “the larger portion of the merry-thought, or wishbone, of a chicken” – the part associated with good luck or the granting of wishes. – “Memoirs of the American Folk-Lore Society”. 1899. Wishbones, sometimes gilded, were incorporated in good-luck luncheons for brides-to-be. One source instructed on tying a gilded wishbone to the bride’s bouquet. 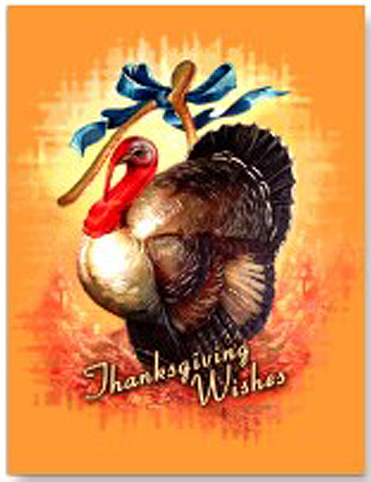 In looking at some of the early uses of the word wish-bone, notice Jan. 1854, “The Western Odd Fellows’ Magazine’s” story of Thanksgiving discussed the custom of pulling the wishbone, and used the word. – Vol. II, No. VII. Mary Elizabeth Prentiss used it in a novel in 1868 in which she also discussed the custom of pulling the wish-bone. In her version the one who came away with the largest piece would have a wish granted. “Mama says she always used to wish to be good, when she had a wish-bone, that’s the reason she is so good now”. – “Little Lou’s Sayings and Doings”. 1868. NY. There are various legends about how the wishbone became a symbol of good luck, but as I’ve not yet discovered an ancient primary text I’ll leave that to the interested reader to pursue. By the 1880’s, however, the legend was well known. “A New York firm sent a large order to Michigan for “wishbones” to be gilded and fastened to good-luck cards for Christmas”. – “Good Housekeeping”. March 3, 1888. Whether you call it a merry-thought or a wish-bone, it wasn’t at all good luck for the fowl from whence it came. © Blissful Meals, TheHistoricFoodie. The top photo is the stew-stove at Jefferson’s Monticello, 19th century, the illustration is from Scappi, 16th century. In the illustration the stew-stove is placed against the wall on the right and pans sit on the openings. Today’s post, like yesterday’s, is an exploration of an antiquated cooking term, i.e. a stew-stove or stew-hole. I first took notice of this term while perusing (for the millionth time) Hannah Glasse’s “The Art of Cookery”, and decided to investigate the era and frequency in which it was used. Henry Neumann  defined stew-hole as, “a small stove in a kitchen-hearth on which anything is put to boil or stew”. It was still found in Edward Gray’s dictionary published in 1900. The stew stove or stew hole was in use by the 16th century, sometimes made of brick and clay, and at other times possibly stone and/or tile. The stoves allowed variance in temperature when cooking in multiple pots. They were first an adjunct to the fireplace, then free-standing, and eventually led to the creation of the cast-iron stove. A stew-hole stove was a permanent fixture. 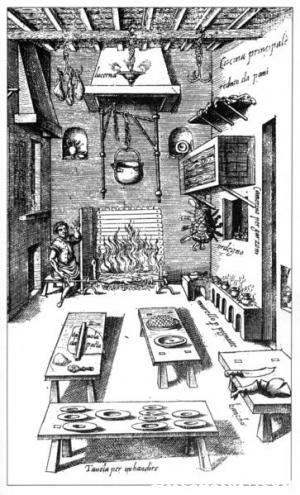 It was a raised structure, usually brick, that allowed the cook to stand while preparing food instead of squatting or bending down to an open hearth at floor level. The stoves had openings a pot was set into and they were heated by a fire underneath. The stoves often had grates which the pots sat on and which held the pots steady over the opening. Some stoves had a grate upon which a fire was built, with the ashes falling below while others had hot coals from a larger fire at the bottom moved up to where they were needed under the pots. 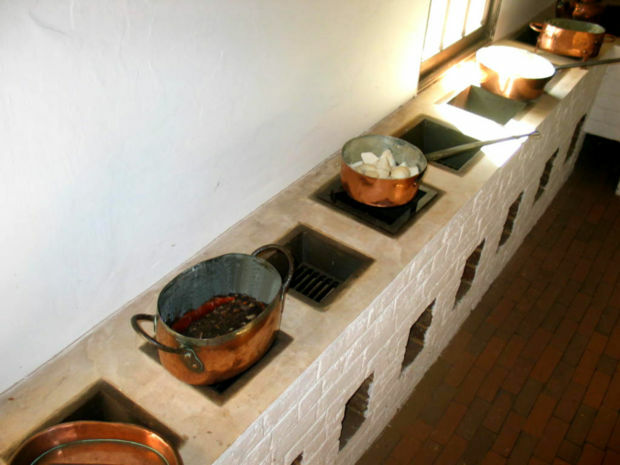 By the earliest part of the 19th century the openings in the brick stew stove could range in number from one to as many as eight as were used at Monticello. One notation seems to have referred to a hole with a dirt bottom, possibly constructed much the same way as the bean-hole in America. “Feb. 10, 1844.—A large eel was found to-day in the stew-hole at Bottisham Hall, deeply imbedded in the mud. The weather this month has been very severe.” For the eel to burrow into the mud, the stew-hole had to be open to the ground underneath. Several 18th century cookery books instruct setting soup or other dishes that needed long slow simmering, “over a slow fire or stew-hole”. Some of the books contained the same recipe, namely Crawfish Soup which called for the use of the stew-hole and it is possible those accounts may be more indicative of the freedom with which writers copied the work of others during that era than of the commonality of the stew-hole in 18th century kitchens. John Perkins told the cook she could keep soup warm until it was served by setting it over the stew-hole. “…strain it, and toast some bread; cut it in small, lay the bread in your dish, and pour in the soup. If you have a stew-hole, set the dish over it for a minute, and send it to table”. Boiled fish was another item that was kept warm until it was served by setting them over a stew-hole. Its efficiency while using less fuel was one of the attributes of the stew-stove, but having used such a stove, I can say that the distance between the grate that held the fire or coals and the bottom of the pot determines how effectively the stove performs. That distance was too great in the one I used and it took much too big a fire to get hot enough for cooking. Neumann, Henry. “A New Dictionary of the Spanish and English Languages”. 1808. London. Cotgrave, Randle. “A French and English Dictionary”. London. Gray, Edward, Iribas, Juan L. “A New Pronouncing Dictionary of the Spanish and English Languages”. 1852 and 1900 editions. NY. Glasse, Hannah. “The Art of Cookery Made Plain and Simple”. 1784. London. Perkins, John. “Every Woman Her Own House-Keeper”. 1796. London. Farley, John. “The London art of Cookery, and Housekeeper’s Complete Assistant”. 1800. London. 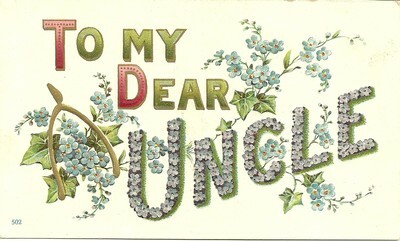 “The Complete Family-Piece; and, Country Gentleman, and Farmer’s Best Guide. 1737. London. Carter, Susannah. “The Frugal Housewife or Complete Woman Cook”. 1796. London. “Outing” magazine. Vol. 47. Dec. 1905. “The Angler’s Guide: Containing Easy Instructions for the Youthful Beginner”. 1828. London. Carter, Charles. “The London and Country Cook”. 1749. London. “The Statutes at Large Passed in the Parliaments Held in Ireland, From the Third Year of Edward the Second, A.D. 1310, to the Thirty-eighth Year of George the Third, A.D. 1798, inclusive.” 1798. Dublin. Jenyns, Leonard. “Observations in Natural History: With an Introduction on Habits of Observing as Connected with the Study of that Science.” 1846. London. Millars. “Letters from Italy”. Vol. II. 1777. London. 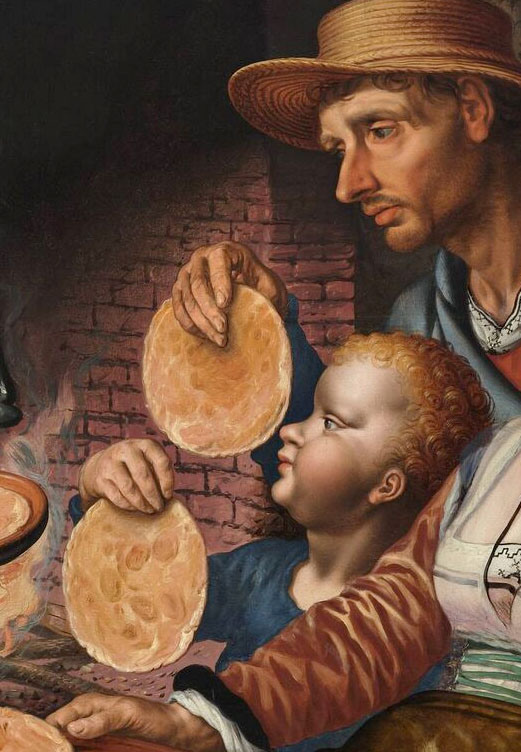 This man and child are eating pancakes as they cook, or hot and hot, rather than everyone being served together at the table. A reader sent an email asking if I knew what a, “hot and hot”, was, with regard to food and drink. I was not familiar with the term, but I love a challenge so I set out to see what I could find. Hot and Hot is not any particular food or drink, instead, it means to serve food, or drink, as soon as it comes out of the pan. In other words, to serve pancakes hot and hot means to serve them as they cook rather than putting them all on a platter and serving them all at the same time. From the Oxford English Dictionary, comes this definition: “HOT AND HOT: Said of dishes of meat, etc. served in succession as soon as cooked; also as noun for the food thus served.” As a noun, a “hot and hot” could be any food or drink served hot to each guest as soon as it was prepared, as an adjective it describes the method of serving the food or drink, – “Serve them the steaks, hot and hot”. From a grammatical standpoint, the phrase is called a reduplicative doublet – a small group of idioms in which a word is repeated after the conjunction “and” when the repetition is intended to provide emphasis to the statement. A doublet is the use of two words with close meaning – like warranty and guarantee, a reduplicative doublet is when the same word is used twice. An example of the latter would be, “again and again”, or, “by and by”. Below are some examples of how the phrase was used, and perhaps perusing them will shed some light on when and why the phrase, “hot and hot”, was used instead of just saying, for example, “Serve Hot,” as it would be today. 1771. “…and you will own I give you them like a beef-steak at Dolly’s, hot and hot, without ceremony and parade, just as they come from the recollections…”. Smollet, Tobias. The Expedition of Humphrey Clinker. 1808. Mrs. Rundell used the phrase with reference to serving mutton steaks, calves liver, and sprats. – Rundell, Maria Eliza. A New System of Domestic Cookery. 1808 and 1833 editions. – Pindar, Peter. The Works of Peter Pindar, Esq. [pseudonym]. Vol. 5. 1812. London. 1815. Louis Simond wrote: “Three successive beef-steaks were broiled under our eyes, over a clear strong fire, incessantly turned, and served hot and hot, tender, delicate and juicy.” Journal of a Tour and Residence in Great Britain During the Years 1810 and 1811. Vol. 2. 1815. NY. 1817. Robert Brown’s collection of poems from 1685 and 1793 contained a poem about food in which was found a line about sheep’s trotters, hot and hot. Comic Poems of the Years 1685 and 1793 on Rustic Scenes in Scotland. 1817. Edinburgh. 1825. “In tippling purl, you drunken sot, Mull’d ale and amber, hot and hot…” came from the same source as these lines: “You’ve only to put on the pot, You’ll roast your pig, and boil your bream, And have your dinner hot and hot; So excellent a cook is Steam!” – The New Monthly Magazine and Literary Journal. Vol. 9. Part I. 1825. London. 1826. Christian Johnstone’s use of the phrase is perhaps a little more illuminating. “The coal fire was always in prime condition,–and short way between the brander and the mouth, Doctor,–served hot and hot—no distance between the kitchen and the hall; before the collop tongs had collapsed in the hands of the cook, in rushed the red-legged waiting wench with the smoking wooden platter.” – The Cook and Housewife’s Manual by Margaret Dods. 1826. 1830. “Dealers vended bread and cheese or squatted beside their baskets…oat-meal and groats for stir-about, or for griddle-cake; or cakes in reality, made from new barley; or old pease boiled soft and black, and kept hot and hot, for immediate consumption—a great rarity; and the last of the motley and picturesquely-grouped traffickers under the market-house, whom we shall notice, was a little and very old man, who dealt in the buying and selling books and pamphlets, generally as worn and as obsolete as himself.” – Banim, John and Michael. – The Denounced. Vols. I and II. 1830. NY. 1831. “We arrived in less than three hours, and in a few minutes sat down to a regular eastern-shore-dinner, of nice ham and chicken, potatoes and pone bread;–but what were these, good as they were in our eye, compared to the dishes of fresh fish, coming in rapid succession ‘hot and hot’ from the pan?” – American Turf Register and Sporting Magazine. Vol. 3. No. 1. Sept. 1831. 1832. “Serve up tortillas hot and hot”. – The Young Gentleman’s Book. 1832. 1833. “From a little corner cupboard she fetched forth cold meat; and when all her materials were ready, Rose spread a nice white cloth over her little round work table; arranged them on it; drew the table near to the fire where William sat, and finally took a seat opposite to him, occupying herself in supplying him, hot and hot, with potatoes roasted to a certain luxurious crispness, by careful and judicious turning on the fire”. – Banim, Michael. The Ghost Hunter and his Family. 1833. Philadelphia. 1837. Mary Holland’s receipt for Sprats reads: “Dress these the same as herrings, except in the broiling: which, if you have not a sprat gridiron, do as follows: when properly cleaned, they should be fastened in rows by a skewer run through the heads, then broiled, and served hot and hot.” – The Complete Economical Cook, and Frugal Housewife. 1837. London. 1842. “I will give you them like a beef-steak at Dolly’s, hot and hot”. Tennyson, Alfred, Lord. Will Waterproof. 1848. “Mutton-chops which were brought in Hot and Hot, between two plates.” Dickens, Charles. Dombey and Son. 1854. “Here his vehemence inciting him to physical action, he began to walk the deck, with something of the mein of a rampant red lion; but still serving up to me concoctions of his wrathe, HOT AND HOT.” Hood, Thomas. The Choice Works . Page 66. 1857. “Pancakes should be served hot and hot to table.” – Traill, Catherine. The Canadian Settler’s Guide. 1857. Toronto. 1872 “They [pancakes] were served ‘HOT AND NOT’ with superb butter and other appropriate accompaniments,..”. —Chicago Tribune. 4 March. Page 3. 1885. “Journalism amongst our cousins lies under a supreme obligation to be swift and tasty. Its courses must be served up to the national table ‘HOT AND HOT,’ with plenty of condiments to give jaded palates a perception of pungency.”—The Musical Times and Singing Class Circular, Vol. 26, No. 508, June. Page 320.